Another CES has came and went, and 2013’s was another incredible year for the CableJive team! Thanks to everyone who came by to share it with us. Here’s just a few highlights from the jam-packed 4 day event. 1.) 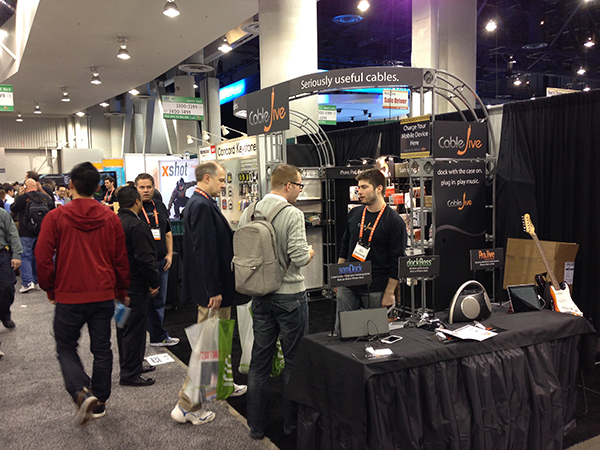 Here’s a shot of our booth from Day 1, right at the start of CES 2013. Complete with interactive ProJive XLR & Instrument displays, fully functioning dockBoss air and samDock displays, the return of our super popular xlSync Charging Station, and our fully stocked product wall. 2.) 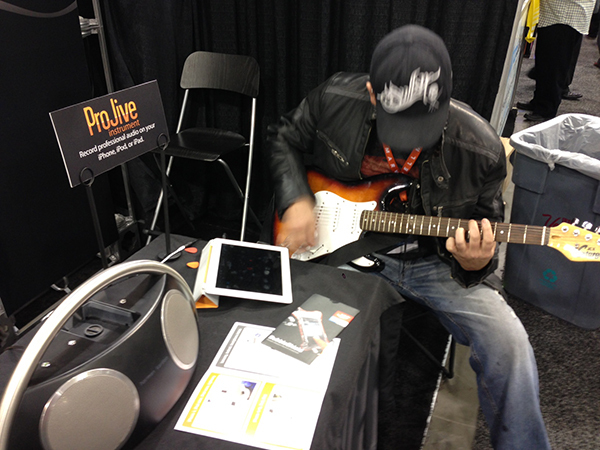 Our ProJive Instrument cable display was set up for visitors to demo, complete with an iPad, Electric Guitar, GarageBand, and a connected speaker dock for anyone who really wanted to rock out. Thankfully, a couple members from the world famous heavy metal band “Lamb of God” stopped by on Day 2 and gave our setup the shredding it deserved! 3.) On Day 3 we decided to really shake things up and did a huge Kaleidaz giveaway. Anyone who stopped by was welcome to take a Kaleidaz cable totally free. We gave away all 1,000 cables before lunch time. 4.) It wasn’t just great to meet so many customers at this year’s show, but many of the media people as well. Here you can see Mike, our fearless leader, getting interviewed on camera right in our booth. 5.) If you ever wanted to know how many business cards you get at these events, take a look at all of these we got, then realize that the show was only half over at this point. 6.) 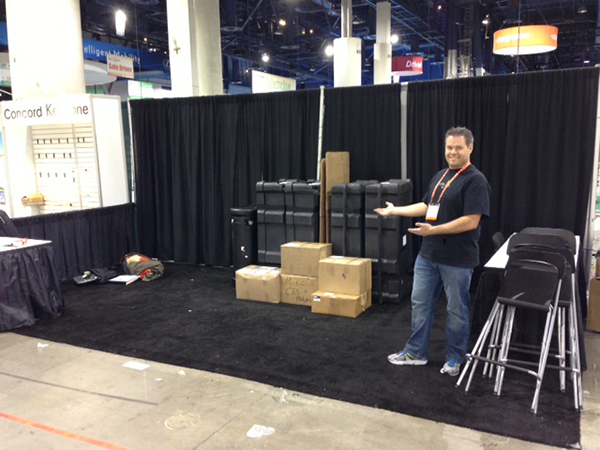 Here’s one last shot of Pete standing victoriously next to our broken-down booth at the end of the show. 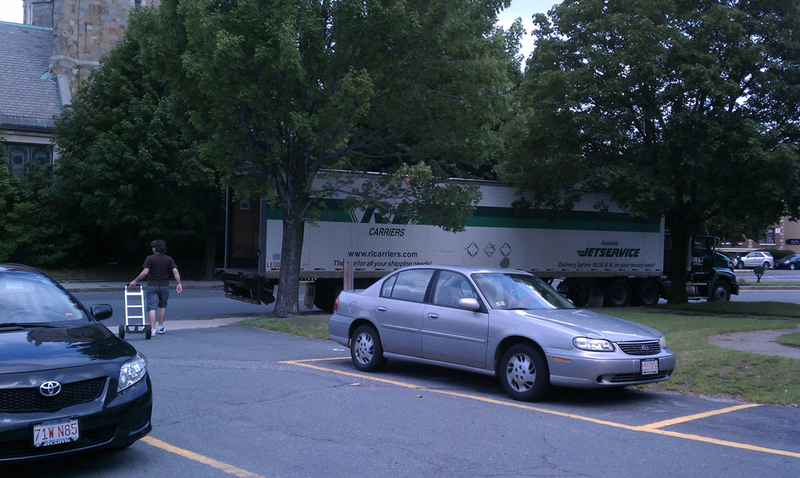 Much less stuff to ship back thanks to everything we gave away. Thanks again to everyone who stopped by our booth this year. See you at CES 2014!! 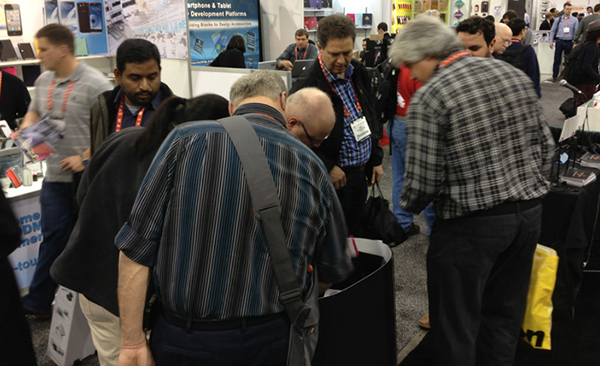 We’re really, really happy about all of the visitors we had in the CableJive booth on day one of CES here in Las Vegas. It being our first CES we weren’t quite sure what to expect but were quickly overwhelmed with groups of people. 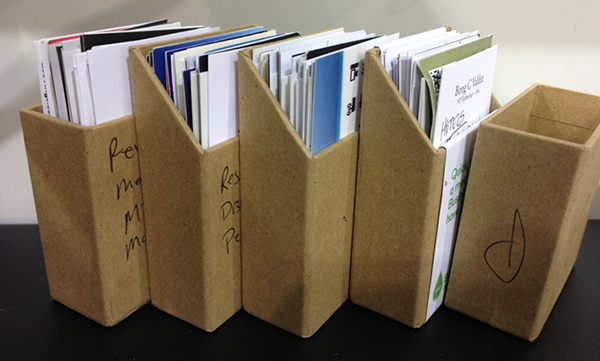 We’ve given away a lot of brochures, pens, and magnet chip clips. If you are at the show, swing by soon before we run out of awesome freebies. 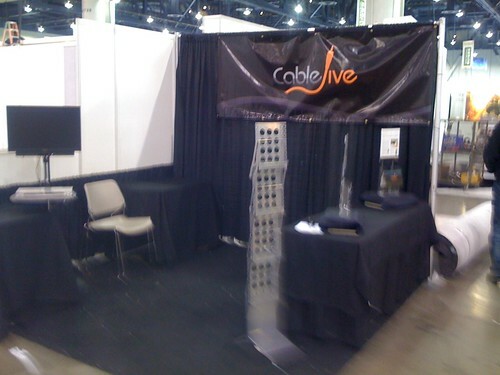 The CableJive CES 2011 booth is set up. We got to meet some nice neighbors who were also setting up. Booth 4625 in the North Hall for anyone who wants to swing by. We have some freebies. One week to go before CES 2011 kicks off. CableJive will be there, at booth 4625. We’re excited to meet folks and chat about all the good things that are going on this year. I’ve been fiddling with the iPhone app, browsing around the maps and looking through the company listings. So much information, for so very many companies. A lot to look through, a hint at the promise of just how much there will be to see and do when in Las Vegas. 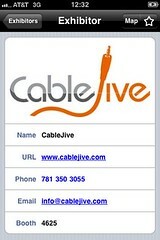 CableJive has it’s own corner of the iPhone app, with company information, booth location, and a few product PDFs. We’re getting excited to meet a bunch of folks, have some fun, and see a whole lot of electronics at the 2011 Consumer Electronics Show in Las Vegas. We’re booth number 4625, we’re looking forward to seeing you there. 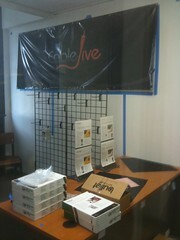 CableJive (mostly our CES expert Cindy) has been really busy, working on all the preparations for the big event. There are a lot of details to coordinate for one of these shows, I had no idea. The sheer volume of the CES instructions handbook requires a dedicated person with a good memory to keep tabs on all of the details. A few months back we set up a CES simulator in one of the CableJive offices. The office dimensions made for a perfect real-world practice area to get the spacing, materials, furniture. It’s been fun to get everything set up and then talk through what we’re seeing. Normally this is our conference room, so we’ve been having our weekly company meetings in the simulator which has spurred lots of conversations, creativity, and speculation about the event. We were there last year, but only to attend.